1　Also pronounced houshu. A sacred gem. Usually a ball or tear-drop shape object that is sacred to Buddhism. It is believed to have the power to expel evil, cleanse corruption, and fulfill wishes. See *nyoi houju 如意宝珠. The term *giboshi 擬宝珠 is often used to refer to the houju shape reproduced as an architectural decoration. 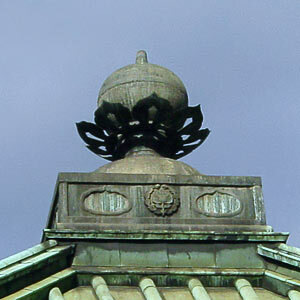 This shape is used on the top of a pagoda *sourin 相輪, on the top of a pyramidal roof *hougyou-zukuri 宝形造, of a Buddhist hall *endou 円堂, on a stone lantern, ishidourou 石灯籠, or on the sculptured head of railing pillars. Houju shaped pillar heads are called houjugashira 宝珠頭; pillars topped with a houju are called houjubashira 宝珠柱 or giboshibashira 擬宝珠柱; and railings with this type of pillar are called *giboshi kouran 擬宝珠高欄. 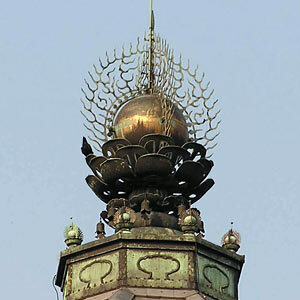 The houju on pagodas and Buddhist halls are usually made of bronze and often decorated with flame designs. The houju with flames rising from it is called kaen houju 火焔宝珠. When used as a decoration for a lantern, the tip of the ball may be sharply pointed or gently rounded depending on the date of the lantern's production, and may be supported by a lotus petal form *ukebana 受花. Generally, the earlier houju have more gentle points and are rounder in form. The tip becomes more sharply pointed and the form more square shaped in the Momoyama period. 2　A houju with a lotus petal base is found as an attribute *jimotsu 持物 of Buddhist figures such as *Jizou 地蔵, *Kokuuzou 虚空蔵, and *Kichijouten 吉祥天, as seen on the 9c Jizou bosatsuzou 地蔵菩薩像 in Houryuuji 法隆寺, Nara.